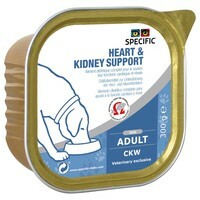 Specific Heart & Kidney Support CKW Wet Food Trays for Adult Dogs is a complete dietetic food developed to provide nutritional support for adult dogs with kidney, heart and/or liver insufficiency. Containing a careful balance of essential vitamins and minerals, a reduced amount of protein and uniquely high levels of Omega-3 fatty acids, the diet will reduce the workload on your cat’s kidneys, whilst helping to support their blood pressure. Additional Taurine and L-Carnitine also help to support the function of the heart. Specific Heart & Kidney Support also has a restricted protein level and added potassium citrate to help prevent the formation of calcium oxalate, urate or cysteine stones. Water retention: Reduced sodium levels help to avoid water retention, which is essential for kidney, liver and heart patients.